Over the last year, my life has changed. My kidneys failed about a year ago and I have had to go on dialysis. The changes in my life although difficult, they have been assisted with the help of the doctors and nurses at the dialysis center but also with the National Kidney Foundation. Besides adjusting emotionally to the medical conditions I now face, dialysis also brings financial hardships to a very tight and limited budget. Besides the cost of the treatments there has been other hardships not anticipated. I live in rural Utah and the nearest dialysis center is about 90 miles away. The cost of traveling 3 times a week is time consuming but also expensive for the fuel and transportation costs. I am very grateful for the help the NKFU has given to offset some of these transportation costs. This help has come from donations to NKFU from various individual and corporate donors. THANK YOU for making this a little easier for those of us that are now dependent on medical treatments to enjoy life each day. with life essential perks and benefits to lighten our burden while we undergo life saving dialysis treatments. was a much needed blessing in the reduction of my monthly fuel costs. In my situation, I drive 3 hours back and forth to get to the closest dialysis center. Help with my fuel costs is crucial for me to continue with consistent treatments along with increasing my healthy emotional well being and lifting my spirits too. all the currency goes towards the administrative costs.This is a great organization to give your donations to because they really reach the patients. I know from first hand experience. See everyone at the National Kidney Foundation of Utah and Idaho™ kidney walk at Thanksgiving Point! Thank you for your continued support and participation of the Ogden Surgical Medical Society Conference. The National Kidney Foundation of Utah & Idaho lectures by Harry O. Senekjian, MD, Kalani Raphael, MD, and Monique E. Cho, MD, improved the performance and competence of 451 attendees: 161 active MDs & DOs ; 95 retired MDs; 52 PAs & NPs; 55 Nurses, Paramedics & Social Workers; 15 Residents, 9 Doctors of Nurse Practitioner Students and 14 Pre-Med students, as well as 35 guests, which included the Hill Air Force Base Medical Providers. I will send the Power Point presentation to your board for the upcoming Annual Meeting. 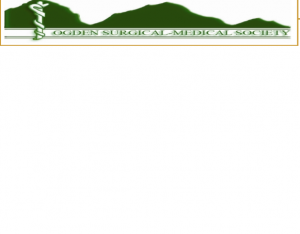 Thanks again and thank you for improving the medical providers of Utah’s performance and competence in nephrology. Every year we aim to update health providers on new information medically related and the National Kidney Foundation of Utah & Idaho excels! In 2003 Yu Young was a bright eyed, sweet tempered and darling high school Junior when she came to the National Kidney Foundation of Utah & Idaho’s Provo office as an intern. For two years, after school, she answered the phone taking Kidney Cars donations, made photocopies and filed. She did everything for everyone in the office. We liked her so much, we hired her as an employee once she started school at BYU. She worked her way through college on our megar non-profit hourly wage while making a substantive and meaningful addition to the staff. She was so good and helpful on the phone, she was helpful and kind in the office, and when she graduated BYU I thought my heart might stop. We had not only come to rely on her, but more, she was our friend. Two days ago, while downloading the Kidney Kars donations, I noticed a car donated from the Young familiy in Provo that included a cheeky little note in the ‘donor comments section.’ It was from Yu. She had helped her mom and dad donate their car online at www.towKars.org I was so touched. 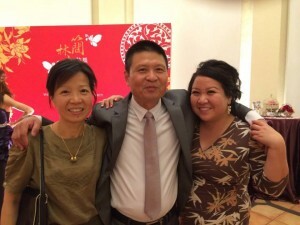 Yu went on to become one of first Chinese Immersion teachers in the Salt Lake City School District and is now the director of all language immersion programs. I miss her here and I am so grateful that even though she’s gone on to much bigger things, she would, in some small and very meaningful way, remember us! Thank you Mr. & Mrs. Young for giving us Yu and for donating your car to Kidney Kars of Utah! Just for fun today, I counted up the number of car donations and the amount of money that I personally have helped the National Kidney Foundation of Utah & Idaho raise through the Kidney Kars donation program ( www.towkars.org) . I started the Kidney Kars program the first year I came to the NKF of U & I and the same year I graduated college in 1991. It was one of the first 5 charity car donation programs in the entire country. I asked my best friend, Simeen Brown, an illustration art major (at the time) to create the artwork for the ads. She helped me come up with the 1-800-tow-Kars phone number. I started by putting a free ads and flyers in the Provo, American Fork, Bountiful, Farmington, Ogden and Salt Lake City Utility Bills and city newsletters. 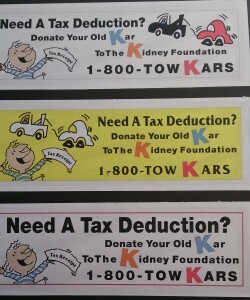 Later Zion’s, First Interstate Bank, and Wells Fargo agreed to put our Kidney Cars flyers into customer statements. These efforts reached over 1,000,000 Utahns and pretty soon the phones were ringing off the hook. Previous to the Kidney Kars car donation program YOU had to pay someone to come take your old car away. So, in two states like Utah and Idaho, famously frugal, financially literate, fiscally conservatives– the idea of free towing coupled with the tax deduction went over like wildfire. So there I was, a young fresh faced girl, just 23 year old and barely out of college hoping to change the world by towing away junk cars. I drove my 1981 silver VW Diesel Rabbit to visit and contract with every wrecking yard in every corner of Utah and Idaho. I put over 20,000 miles on the rabbit that year, and then donated the next year to Kidney Kars with about 285,000 miles on it. (I replaced the rabbit with a 1990 VW Golf GTI). In an industry (towing, wrecking yards, scrap metal) where integrity, charity, and ‘environmentally friendly’ were laughable ideas, I somehow talked them into PAYING US– the Kidney Foundation– for a steady stream of donated cars (and to tow them away for FREE). I cut contracts with agencies whose ‘service center’ consisted of guys shirtless under their overalls, missing teeth, chewing a toothpick with a vacant look in their eyes. With the money I got them to pay us for those car donations, the NKF of U & I was able to fund the first life saving financial aid/patient services programs and began funding local medical research. It was a miracle. At the time, the price of scrap metal was $30 a ton (today it’s more in the $225-350 range). So we were getting between $30-$75 just for junk cars. The third year of operation, a doctor from Sandy, Utah donated a 1963 Mercedes 250 SL convertible with red leather interior and white wall tires. We got England Trucking to haul the car down to the Barrett-Jackson Auction in Scottsdale for free. The auction donated the sales space and fees. We made $17,600. This single-handedly funded two years of the Kidney Patient Educational Scholarship program (for young adult/ pediatric Kidney Transplant recipients). It’s weird how I got my motivation and experience to make money for charity by selling used cars. I grew up in East County Southern California with a dad who LOVED cars– Baja bugs, dune buggies, and race cars. He was fond of German engineering and diesel engines. Our garage was bigger than our house and it’s where he spent most of his time. We had no less than 8-10 running cars at any given time. It was my job to change oil, make sure there was water in the battery caps, that the cables were connected, the idle adjusted, and that there was correct air pressure in the tires. I also washed and detailed (vacuumed under seats and shook rugs, Amour All-ed the seats/dash/tires, Windex-ed the windows inside and out, chamois dried the body, and then hand waxed) at least 3 cars every Saturday before I could even THINK about asking to do something fun. But not until I’d assisted my dad further (usually overhauling an engine or transmission) by cleaning his car parts in an open pan of gasoline, and then using a wire brush to scratch off the oily gunk. I got $4.00 per car per full detail, plus a little extra for the garage assist. Today, a detail job like that will run you $60.00 a car. My favorite cars were my Dad’s Diesel Mercedes 250D, a Porsche 911 and a Porsche 935 (a Candy Apple red, Turbo Carrerra). My Dad is dead now, so I can say this out loud. But one night when he was away (during a full moon) I drove the red Porsche East on Highway 8 through the Ocatillo Desert and the Imperial Valley. That car easily traveled at 120 mph without even engaging the turbo. It was an amazing machine. But, in spite owning an extra Porsche, I was given a 1967 pieced out VW Bug to drive. It had 3 different colored quarter panels. “Pretty girl, Ugly car” is what my Dad always said. We lived on 5 acres of dusty granite with a few horses, and a LOT of cars. That’s how it was. My first taste of fundraising was at BYU (Provo, Utah). I started the first on campus Woman’s Rights group “Voice”– which I had to help keep funded to keep it alive. Additionally, I worked in the library as a research/reference assistant and helped professors get their grants so I could have a job. After college, a good friend told me his Mother (CEO, Deen Vetterli) was trying to start a fundraising program selling donated used cars. It was the perfect segway between my experience in grant writing and fundraising and a history of working on old cars and being comfortable haggling prices with wrecking yards. By starting the Kidney Kars program, I imagined every wife and daughter in America (whose husband or dad had 8 cars parked around the house) breathing a collective deep sigh of relief. Finally! A tax deduction and free towing as an incentive to get rid of all those cars parked out back. In fact one of the first huge car donation projects publicized on all the news channels, was when a 80 year old retired car dealer in Sunset Utah was given a notice by the city to get rid of his rotting inventory parked out back. He had 40 cars on his property and no way to get rid of them ( http://www.deseretnews.com/article/624713/Foundation-hits-gold-40-old-cars-in-the-mud.html?pg=all). It was huge and together with all the community and municipal support and the Governor’s appointment of the Kidney Kars program to the “Take Pride in Utah” (Utah’s Statehood Centennial Celebration) Kidney Cars and Kidney Kars hit pay dirt and kept on rolling along. 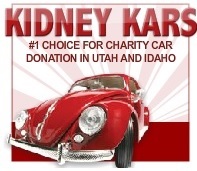 So many generous people have given us their Kidney Car/ Kidney Kars charity car donation in Utah and Idaho. 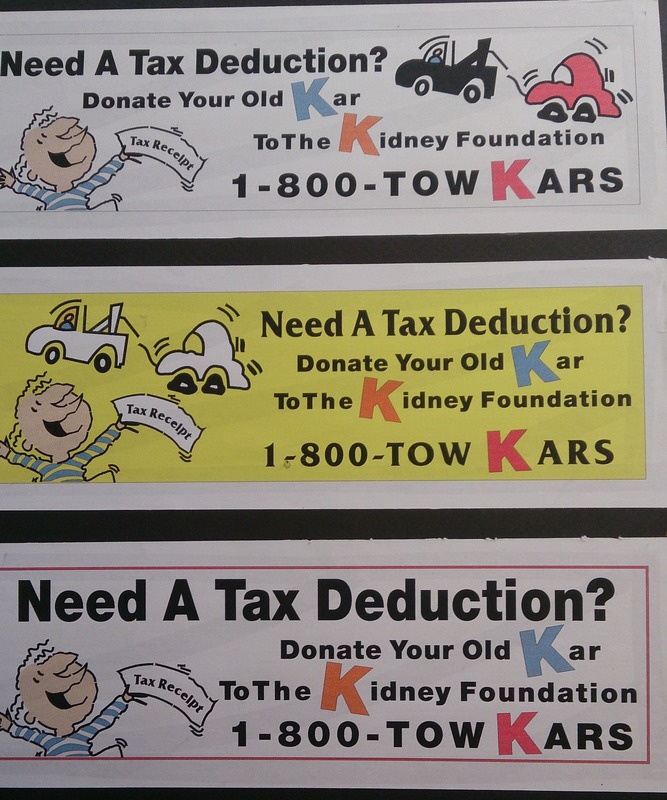 Many, many people repeated their car donations time and again (up to 5 donations in 10 years) just for the tax deduction and the free towing. Even with the changes in the tax law that limits the amount that can be claimed on their taxes, and even the Cash For Clunkers incentive– Utahns and Idahoans have continued to generously give the Kidney Foundation their ‘Kidney Kars’ charity car donations. Such generous, decent people in Utah and Idaho. I pledge allegiance to Utah for giving my weird skill set a purpose and my deepest car related neurosis a therapeutic outlet. I have personally overseen every single aspect of the National Kidney Foundation of Utah & Idaho’s Kidney Kars / Kidney Cars donation program (1-800-Tow-Kars and the development of www.towKars.org). I am proud to say, we have received and sold more than 92,000 vehicle donations and raised over $20,000,000 dollars on behalf of Utah and Idaho Kidney Patients. Kidney disease and dialysis are so miserable for so many people. I have made and lost so many friends to Kidney Failure since 1991. How can I thank the Kidney Foundation enough for giving me a meaningful little place in the world to help save lives and help lighten the burden and improve the quality of life for Utah and Idaho Kidney patients? I can personally assure you that your Kidney Cars/Kidney Kars donation in Utah and Idaho is put to amazing good use locally. I had your 8th grade health class last year and heard the Kids and Kidneys presentation. You’re probably wondering why I am emailing you out of the blue. It’s not to see if you remember ME out of thousands of students but rather, I just thought you might be interested to know that your class has changed my life, and hopefully is about to change someone else’s. Ever since your Kidney Organ Donation activity I have been so interested in Organ Donation and have always wanted to be able to donate. When I was younger I thought the only way was to hope that donation after death would be a possibility for me. As I got older, I realized living donation is something I would be willing to do for someone I loved. I secretly wanted to know someone, who knew someone that needed a donation. Earlier this year, I realized that I do not need to wait for someone I know to become sick, as I researched ‘Good Samaritan’ donors. I have now “applied” for Good Samaritan donation through YES Utah. I have undergone a medical history evaluation for living kidney donation to a person in need. I have my first testing appointment today, and will continue to test to find a match. I’m am beyond excited for this. To be able to improve someone’s quality of life like this would be a dream come true. My fingers are crossed that I will for sure be able to be a donor, without problems. I just wanted to let you know that without your class I would have not considered this to the extent it took. I wouldn’t have been nearly as interested, and it wouldn’t have been something I always think about. Thank you for your inspiration. I am always SO cold. https://www.towkars.org/wp-content/uploads/2018/02/towkars-car-donation-logo-300x165-300x165.png 0 0 kidneyadmin https://www.towkars.org/wp-content/uploads/2018/02/towkars-car-donation-logo-300x165-300x165.png kidneyadmin2011-12-09 15:08:382011-12-09 15:08:38I am always SO cold.